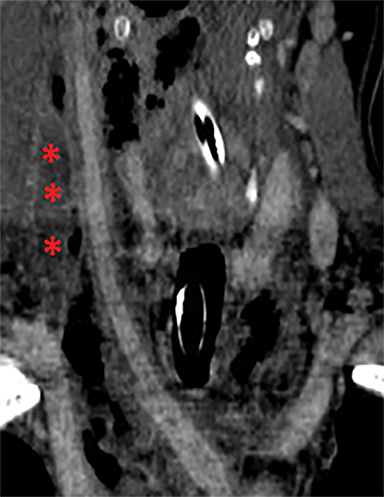 Management paradigms in blunt and penetrating neck trauma have evolved over time to increasingly rely on imaging – particularly multidetector computed tomography (MDCT) – to guide surgical, endovascular and medical intervention. The role of the radiologist is therefore increasingly important. 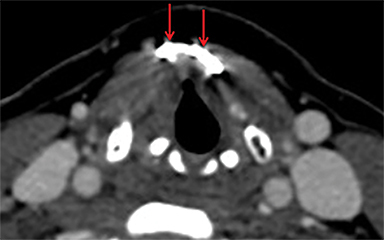 This review will discuss the common imaging features and management implications of traumatic injury to the soft tissues of the neck, particularly emphasizing laryngotracheal and pharyngoesophageal injury. Although the spectrum of injury from blunt or penetrating trauma to the neck is broad, several identifiable patterns exist which correspond to specific mechanisms of injury. The so called “padded dashboard” constellation of injuries,16 results from neck hyperextension during rapid acceleration followed by blunt impact of the anterior neck on the car dashboard or steering wheel. This is seen in unrestrained passengers or drivers hit from behind. The injury pattern is that of hyperextension shearing injuries accompanied by crush injuries to the anterior neck. Rapid increase in intrathoracic or intratracheal pressure against a closed glottis during blunt chest or lower neck impact can result in laryngotracheal rupture. Any component of the subglottic airway can be affected, depending on the level of impact. The prototypical example would be tracheal rupture after rapid deceleration with inappropriately high seat belt position across the lower neck/chest. The larynx is suspended in the neck via attachments to the hyoid bone superiorly and through fixation inferiorly by the immobile cricoid ring. Extrinsic muscles of the larynx also assist in positioning the larynx in the neck, with attachments to the base of the tongue, mandible, pharynx and sternum. The myoelastic and aerodynamic properties of the larynx are fundamental to phonation and airway protection. An intact cartilaginous skeleton is the most basic requirement for functionality. Disruption of the endolaryngeal structures including the vocal cord attachments, arytenoid cartilages and mucosal epithelial lining itself also interfere with laryngeal function. Intrinsic muscles of the larynx are also integral to phonation and are innervated by two branches of the vagus nerve, the recurrent laryngeal nerve and the external branch of the superior laryngeal nerve. Significant trauma to the anterior neck with or without abnormal physical exam (i.e., dysphonia or hemoptysis). Continuity and condition of the endolarynx and trachea not adequately evaluated endoscopically due to hemorrhage or edema. Physician is uncertain of extent of laryngeal injury. Imaging can be performed under supervision of personnel capable of securing an emergency airway. The hyoid bone itself can be malpositioned, indicating disruption of its attachment to the base of tongue and mandible superiorly or of its inferior strap muscle and membranous attachments to the thyroid cartilage and sternum. Hyoid fractures, dislocations and subluxations can occur with blunt trauma, especially strangulation injuries. Particular attention should be paid to the epiglottic petiole as avulsion of the thryoepiglottic membrane is often surgically repaired.18 Definitive diagnosis is made at endoscopy, but hematoma or edema involving the petiole on CT or MRI as well as widening of the pre-epiglottic space can be indicative. 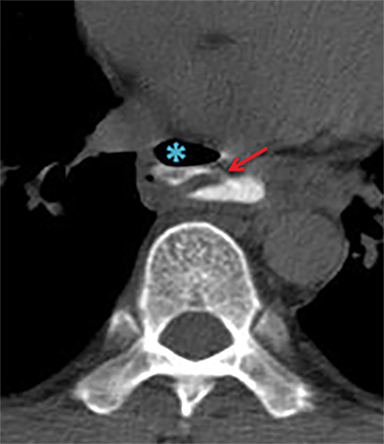 The thyroid and cricoid cartilages can fracture, buckle and dislocate with respect to each other (Figure 4) Paraglottic hemorrhage and/or edema as well as abnormal endolaryngeal contour or configuration are findings at CT that often accompany cartilage injuries (Figure 4) In newer management paradigms, laryngeal cartilage fractures are surgical lesions, reduced and fixed with adaptation plating to restore the skeletal anatomy necessary for proper phonation (Figure 5).11 The surgical approach is informed by whether the fractures are stable (not significantly displaced) and whether there is accompanying endolaryngeal mucosal injury. 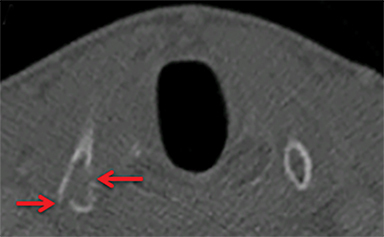 If there is high suspicion for cartilaginous injury without a frank fracture line or abnormal contour to the cartilage by CT, MRI may add additional value and is best performed with thin section (2-3mm slice thickness), small field of view and large matrix size (15), preferably at high field strength. Cricoarytenoid dislocations and subluxations are managed with operative reduction to create a pseudoarthrosis, with or without adjunctive medialization procedures such as vocal fold injections and/or thyroplasty. The prognosis for normal phonation is variable.2,11,22 In contrast, unilateral RLN injuries are often treated with medialization procedures if conservative management outcomes are suboptimal. There is of course no indication to attempt cricoarytenoid joint reduction if the injury is neurogenic. For the sake of simplicity, pharyngeal and esophageal trauma can be categorized as that resulting from blunt or penetrating external trauma or from internal trauma such as instrumentation or foreign body ingestion. The modern paradigm for imaging in penetrating neck trauma favors MDCTA if there are no hard signs warranting immediate neck exploration. In blunt neck trauma, patients will often get imaged with MDCTA in order to screen for cerebrovascular injury, providing opportunity to evaluate for pharyngoesophageal perforation. 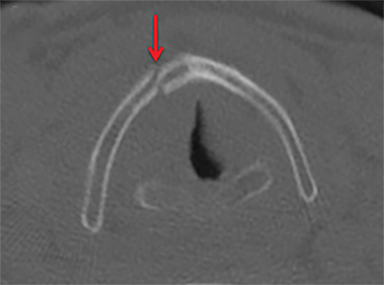 In foreign body ingestion, frontal and lateral neck radiographs are often the first line evaluation, but CT is more sensitive and specific, provides more information about precise location and can assist in identifying perforation, fistulas and abscesses.8 In particular for bone ingestions, some referring physicians may favor initial evaluation with CT.24 Sharp ingested foreign bodies such as fish and chicken bones have a predilection for lodging at the base of tongue/vallecula, at the piriform sinuses or in the postcricoid hyopharynx just above the narrow cricopharyngeal sphincter.8 They are also the foreign bodies most likely to result in perforation. 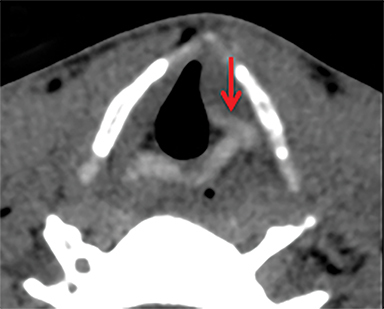 Signs of pharyngoesophageal perforation at CT include parapharyngeal or paraesophageal gas or fat stranding and occasionally frank communication of the esophageal or pharyngeal lumen with adjacent extraluminal collections of gas and/or fluid. If CT findings are inconclusive or if there is high clinical suspicion, particularly in penetrating trauma where the tract is in close proximity to the alimentary structures, further evaluation with CT or fluoroscopic esophagography may be warranted. Water-soluble contrast (Gastrografin) should be used first line, and can be followed with dilute barium. In Figure 8A, there is a gas and Gastrografin fluid collection in the mediastinum. 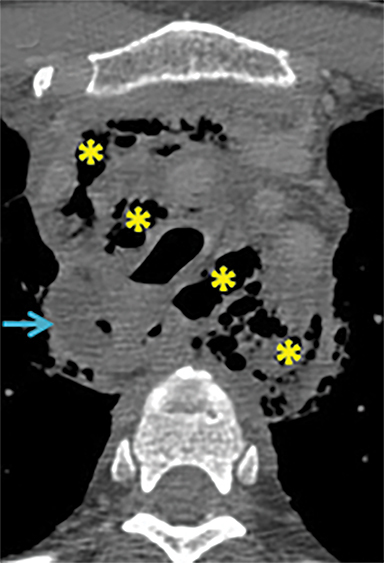 Both fluoroscopic and CT esophagography have similar sensitivities for esophageal perforation, but rigid esophagoscopy detects small lacerations below the resolution of imaging, 11 although at the expense of requiring general anesthesia. Although rare, blunt and penetrating trauma to the soft tissue structures of the neck is associated with high morbidity and mortality. CT is increasingly utilized to simultaneously evaluate the vascular anatomy and the upper aerodigestive structures. 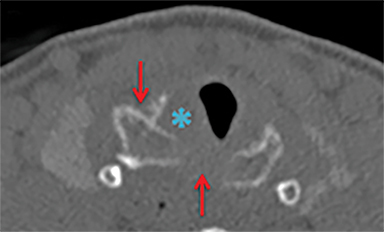 While management of laryngotracheal traumatic injury continues to evolve, knowledge of current practices allows radiologists to assist in triage algorithms and help guide surgical and interventional treatments. Gussack GS, Jurkovich GJ, Luterman A. Laryngotracheal trauma: A protocol approach to a rare injury. Laryngoscope. 1986;96(6): 660-665. Atkins BZ, Abbate S, Fisher SR, et al. Current management of laryngotracheal trauma: Case report and literature review.J Trauma. 2004;56(1):185-190. Demetriades D, Velmahos GG, Asensio JA. 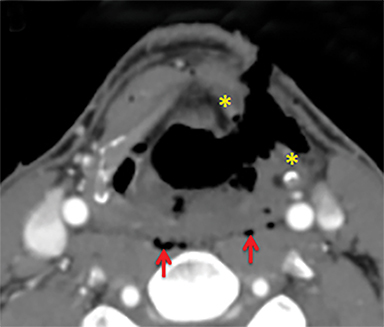 Cervical pharyngoesophageal and laryngotracheal injuries.World J Surg. 2001;25(8): 1044-1048. Steenburg SD, Sliker CW, Shanmuganathan K, et al. Imaging evaluation of penetrating neck injuries.RadioGraphics. 2010;30(4): 869-886. Biffl WL, Moore EE, Offner PJ, et al. Blunt carotid arterial injuries: Implications of a new grading scale.J Trauma. 1999;47(5):845-853. Bromberg WJ, Collier BC, Diebel LN, et al. Blunt cerebrovascular injury practice management guidelines: The Eastern Association for the Surgery of Trauma.J Trauma. 2010;68(2): 471-477. Sung EK, Nadgir RN, Sakai O. Computed tomographic imaging in head and neck trauma: What the radiologist needs to know.Semin Roentgenol. 2012;47(4): 320-329. Pinto A, Muzj C, Gagliardi N, et al. 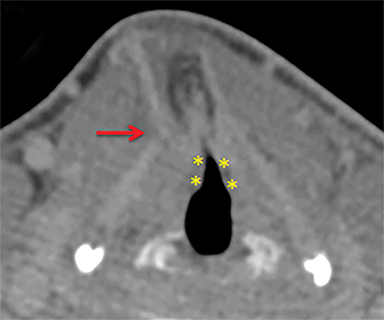 Role of imaging in the assessment of impacted foreign bodies in the hypopharynx and cervical esophagus.Semin Ultrasound CT MR. 2012;33(5): 463-470. Mendels EJ, Brunings JW, Hamaekers AE, et al. Adverse laryngeal effects following short-term general anesthesia: A systematic review.Arch Otolaryngol Head Neck Surg.2012;138(3): 257-264. Bell RB, Osborn T, Dierks EJ, et al. Management of penetrating neck injuries: A new paradigm for civilian trauma.J Oral Maxillofac Surg. 2007;65(4):691-705. Schaefer SD. Management of acute blunt and penetrating external laryngeal trauma. Laryngoscope.2014;124(1): 233-244. Apffelstaedt JP, Muller R. Results of mandatory exploration for penetrating neck trauma.World J Surgery. 1994;18(6):917-919; discussion 920. Liang T, Tso DK, Chiu RY, et al. Imaging of blunt vascular neck injuries: A review of screening and imaging modalities.AJR Am J Roentgenol. 2013;201(4): 884-892. Liang T, Tso DK, Chiu RY, et al. Imaging of blunt vascular neck injuries: A clinical perspective. AJR Am J Roentgenol. 2013;201(4): 893-901. Becker M, Leuchter I, Platon A, et al. Imaging of laryngeal trauma. Eur J Radiol. 2014;83(1): 142-154. Prokakis C, Koletsis EN, Dedeilias P, et al. Airway trauma: A review on epidemiology, mechanisms of injury, diagnosis and treatment.J Cardiothorac Surg. 2014;9: 117-8090-9-117. Schaefer SD. The acute management of external laryngeal trauma. A 27-year experience.Arch Otolaryngol Head Neck Surg. 1992;118(6): 598-604. 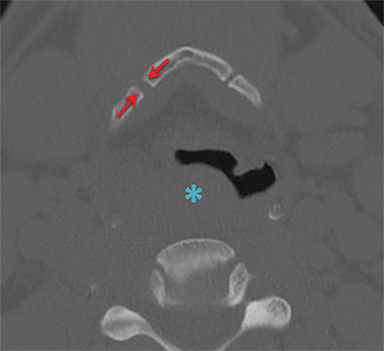 Duda JJ, Lewin JS, Eliachar, I. MR evaluation of epiglottic disruption.AJNR Am J Neuroradiol. 1996;17(3): 563-566. Schroeder U, Motzko M, Wittekindt C, et al. Hoarseness after laryngeal blunt trauma: A differential diagnosis between an injury to the external branch of the superior laryngeal nerve and an arytenoid subluxation. A case report and literature review.Eur Arch Otorhinolaryngol. 2003; 260(6): 304-307. Paquette CM, Manos DC, Psooy BJ. 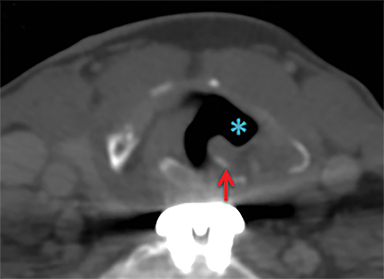 Unilateral vocal cord paralysis: A review of CT findings, mediastinal causes, and the course of the recurrent laryngeal nerves.RadioGraphics. 2012;32(3): 721-740. Hiramatsu H, Tokashik R, Kitamura M, et al. 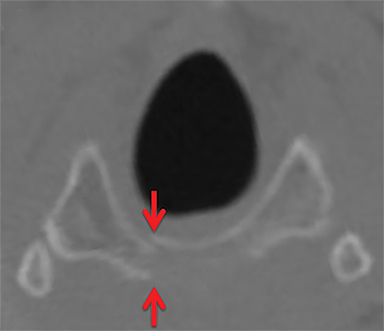 New approach to diagnose arytenoid dislocation and subluxation using three-dimensional computed tomography.Eur Arch Otorhinolaryngol. 2010; 267(12): 1893-1903. Sataloff, RT. Atlas of Endoscopic Laryngeal Surgery. New Delhi: Jaypee Brothers Medical Publishers; 2011. Cross KJ, Koomalsingh KJ, Fahey TJ, et al. Hypopharyngeal rupture secondary to blunt trauma: Presentation, evaluation, and management. J Trauma. 2007;62(1): 243-246. Eliashar E, Dano I, Dangoor E, et al. 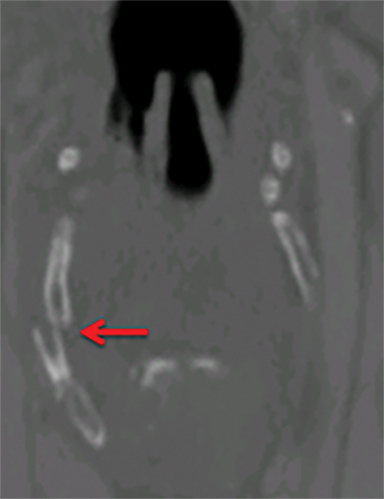 Computed tomography diagnosis of esophageal bone impaction: A prospective study. Ann Otol Rhinol Laryngol. 1999;108(7 Pt 1): 708-710. Miracle AC, Uzelac A. Imaging blunt and penetrating trauma to the neck: Clinical relevance and management. Appl Radiol. 2016;45(7):14-19. Dr. Miracle and Dr. Uzelac are with the Department of Radiology and Biomedical Imaging, University of California, San Francisco. Dr. Uzelac is also with San Francisco General Hospital, San Francisco, CA. 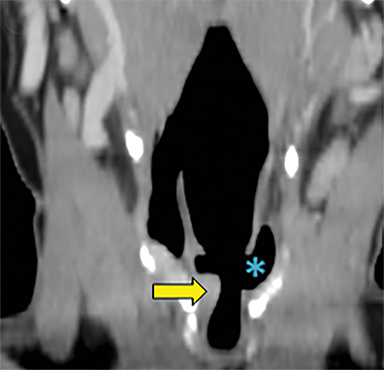 Some of the images accompanying this article were presented in a University of California, San Francisco Radiology Highlights Course Oct. 13-17, 2014.